What does a kdb+ database look like on disk? What is the best configuration for high availability? How does the system recover? Disasters are inevitable; hardware failure, network problems, and data corruption are all events that could play havoc with a system. If these events are not fully understood and planned for they may lead to significant downtime and potentially severe business impact, including revenue loss, legal and financial implications, and impact to business reputation and brand. Recent high-profile systems failures of a large cloud computing provider and an international airline highlight the importance for IT systems to have a comprehensive disaster recovery plan in place. This whitepaper discusses disaster recovery (DR) and failover concepts from the perspective of the gateway layer accessing a typical kdb+ tick system used in capital-markets applications. The end goal of constructing this plan is to ensure high availability of the application via the gateway where possible, considering all conceivable failure scenarios and outlining any actions required to prevent data loss, minimize any downtime and keep the application accessible. As part of business-continuity and DR planning, the RTO, or Recovery Time Objective, is the maximum target time set for recovery of the systems after a disaster has struck. How quickly the system needs to recover can dictate the type of preparations required and determine the overall budget you should assign to business continuity. If for example, the RTO is three hours, meaning your business can only survive with systems down for this amount of time, then you will need to ensure a high level of preparation and a higher budget to ensure that systems can be recovered quickly. On the other hand, if the RTO is two weeks, then you can probably budget less and invest in less advanced solutions. The RPO, or Recovery Point Objective, is the maximum targeted period in which data might be lost from the system due to a major incident. Alternatively, the RPO is the maximum tolerable period in which data might be lost from a critical IT service or system. A disaster recovery plan is usually based on requirements from both the RTO and RPO specifications which can guide the design of a cost-effective solution. However, every system has its own unique requirements and challenges; therefore, this paper does not propose a “one-size-fits-all” approach. Rather, it suggests the best practice methods for dealing with the various possible failures one needs to be aware of and plan for when building a kdb+ tick-based system. This paper does not deal with many failure conditions of a kdb+ system outside of the ticker plant model used in capital markets. a specialized kdb+ process that operates as a link between the client’s data feed and a number of subscribers. It receives data from the feedhandler, appends a time stamp to it and saves it to a log file. It publishes this data to a real-time database and any clients which have subscribed to it and then purges its tables of data. In this way, the tickerplant uses very little memory, whilst a full record of intra-day data is maintained in the real-time database. holds all the intra-day data in memory to allow for fast, powerful queries. consists of on-disk kdb+ data, typically split into date partitions. A q process can read this data and memory-map it, allowing for fast queries across a large volume of data. The RDB is instructed to save its data to the HDB at EOD (end of day). Before we consider creating a disaster-recovery plan, we first must understand the layout of a typical kdb+ database on-disk. Kdb+ databases are stored as a series of files and directories on disk. This makes handling databases extremely easy because database files can be manipulated as operating system files. Backing up a kdb+ database can therefore be implemented by using any standard file-system backup utility. This is a key difference from traditional databases, which have their own backup utilities and do not allow direct access to the database files. Kdb+’s use of the native file system is also reflected in the way it uses standard operating-system features for accessing data (memory-mapped files), whereas traditional databases use proprietary techniques in an effort to speed up the reading and writing processes. The typical kdb+ database layout for a tick-based system is partitioned by date, although integer partitioning is also possible. Below is an example of an on-disk layout with date partitions as represented using the Linux program tree. The example above displays the various file-system entities which constitute a kdb+ database. Highlighted in bold are directories, which can be either a partition or a splayed table directory. The splayed table directories contain individual column files and a kdb+ .d file which contains the column ordering. A file called sym also exists at the top level and is used for enumerations of table columns of symbol type. Splayed or flat tables can also exist in the database at the top level but are excluded here for simplicity. The standard approach to saving data to an on-disk database (HDB) is to use the .Q.dpft utility, usually from an in-memory real-time database via an end-of-day write-down function (see .u.end in r.q). This utility creates the files and directories as laid out in the table above, along with applying a parted attribute to the specified column. Save enumerated table splayed to date partition. Parent directories are created by set if they do not yet exist. Note that as part of setting a splayed table, the column .d file is automatically written by kdb+. After these steps, the database can now be loaded into q via a simple \l command. These step-by-step methods can become useful for fixing issues that may occur on specific files or date partitions. For example, if we need to reorder our table columns, or we have a schema change, then the .d file can be overwritten with a simple set. The dbmaint.q script) provides some useful utilities for editing and maintaining a historical database (HDB). Generally, these functions are safer and should be used in place of the raw commands for any database amendments. In the event that a database needs to be restored to the latest backup version, it is as simple as restoring the file-system entities from the backup location and reloading any HDB processes via the load command. In a kdb+ tick setup, failover can be designed and configured at a whole system level or at a process-by- process level. Generally, if a critical process goes down and does not restart then the entire system will failover to a mirrored secondary or backup system. However, if a non-critical process goes down and does not restart then it may be judged unnecessary to failover the entire system to the secondary server. The mirrored process on the secondary server may be able to take over from the failed process. Alternatively, in the case where there are multiple processes in a group (e.g. HDBs) on the primary side for load balancing reasons all accessing the same data, then the remaining processes within the group will simply pick up the slack after the failure and no switching would be required. However, the issue of failure must be investigated and fixed to restore full functionality of the system. In all the various combinations of failover operations that can be designed, the end goal is always to maintain availability of the application and minimize any disruption to the business. In a production environment, some level of redundancy is always required. Depending on the use case, requirements may vary but in nearly all instances requiring high availability, the best option is to have a hot-hot (or ‘active-active’) configuration. Hot-hot is the term for an identical mirrored secondary system running, separate to the primary system, capturing and storing data but also serving client queries. In a system with a secondary server available, hot-hot is the typical configuration as it is sensible to use all available hardware to maximize operational performance. The secondary system has a complete backup or copy of the primary system at some previous point in time (recall that kdb+ databases are just a series of operating system files and directories) with no live processes running. A failover in this scenario involves restoring from this latest backup, with the understanding that there may be some data loss between the time of failover to the time the latest backup was made. The secondary is on standby and the entire system can quickly be started to allow recovery in a shorter time period than a hot-cold configuration. Typically kdb+ is deployed in a high-value system; hence, downtime can impact business, which justifies the hot-hot setup to ensure high availability. Usually, the secondary will run on completely separate infrastructure, with a separate file system, and save the data to a secondary database directory, separate from the primary. In this way, if the primary system or underlying infrastructure goes offline, the secondary would be able to take over completely. The following diagram shows the basic kdb+ tick components, with the primary (A) processes in green and the secondary (B) processes in red. In addition to the standard tick processes shown below, there could be a combination of gateways, Complex Event Processor engines (CEPs) or query router processes. These generally provide various methods to carefully manage any querying of the database. As mentioned above, the usual strategy for failover is to have a complete mirror of the production system (feedhandler, tickerplant, and real-time subscriber), and when any critical process goes down, the secondary is able to take over. Switching from production to disaster recovery systems can be implemented seamlessly using kdb+ interprocess communication (via .z.pc). An alternative method is to have a parent control process monitoring everything within the system with heart-beating: a simple message sent from the control process to another asking Are you alive? In the event that a process is unreachable, the parent control process signals failover of the whole system to the secondary. This is obviously more complex than using .z.pc between system processes to trigger the failover, but the advantage is that the whole system can be controlled from a single process pair (primary and secondary). While there are other ways to provide additional backup, there is generally no real alternative to having a parallel collection system for a high-availability kdb+ tick solution. In designing the disaster-recovery plan, all possible failure events should be identified, assessed in terms of overall risk, impact and likelihood of occurrence, and planned for. The following section considers the options available for the various kdb+ tick system components within this simplified architecture. It is important to design the system so it is resilient and fault-tolerant, including adequately specifying the memory requirements for the RDB and the system as a whole. Considerations for determining these requirements include the peak message rate, expected daily data volumes, schema width, query load and complexity and many others. 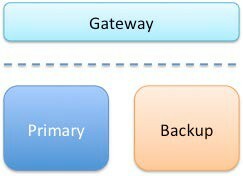 If a real-time database does go down, then it is usual practice to trigger a failover to the secondary RDB, such that the gateway will only route queries to the secondary RDB while the primary is offline or recovering. Failover can be signaled via .z.pc. Usually, the handles to the secondary RDB are opened prior to any failover occurring, and it is simply a case of pointing the query to the secondary RDB handle, in place of the primary RDB handle. In larger applications, an application delivery controller (ADC) is often used to control the routing of queries between the application and the client. It is up to the system architect to decide if the secondary RDB should continue to serve queries when the primary is available again, or revert to using the primary RDB again. A failback process includes data recovery of any data loss during the downtime and restoring the operations back to a pre-failed over state, i.e. primary and secondary systems are running and available. Generally, it is recommended that fail-back to the primary be scheduled during a downtime window. This is to ensure sufficient time to validate that data is synchronized, functional and that processing is fully restored at the primary system. There are some applications where you may not have maintenance or downtime windows available for fail-back. If this is the case the restoration of the primary must occur in parallel with normal operations on the secondary system and the data synchronization, reconciliation and fail-back processes automated. To recover the primary RDB it should be restarted either manually, or using system tools, but it will have lost all the intra-day data published by the tickerplant so far for the day. To recover this intra-day data and regain a subscription to the data feed on restart, the RDB sends a subscription request to the tickerplant which returns a message containing the location of the log file and the number of lines to read. The RDB replays the number of lines specified from the log file, storing the results in memory. In this way, the RDB has recovered all tickerplant data up to the line number received at the start of replay. If required to recover other non-tick data, recovery steps should be built into the initial state function, which would run during the start-up of the RDB and with this data being loaded from the specified source. The restarted RDB receives all subsequent updates from the tickerplant. If updates arrive whilst the RDB is reading from the log file, they are buffered in the TCP/IP buffer. If the log file is large enough, then the replay may take enough time that the buffers fill. In this case, the messages are kept in the main tickerplant process memory (this can be seen in .z.W in the TP). Replaying the log can potentially take several minutes or more, depending on the size of the tickerplant log file, therefore the gateway queries should continue to be routed to the secondary until recovery and failover are complete, and the primary RDB is available to capture data and serve queries again. Some well-developed kdb+ systems survived many market events which brought other systems to their knees, however, it is possible that an HDB may become unreachable, but through proper database maintenance, access rights, correct dimensioning and recovery procedures, users can avoid incapacitating an HDB. HDB process failures and wsfull errors are usually an indication that a process has been incorrectly dimensioned, or access control has not been applied. If an HDB fails to load, there could be various underlying causes (corrupted partition, corrupted sym file, spurious file in the HDB directory, read/write access), but the most usual case is a corrupted partition. This could potentially be due to an error in the end-of-day write from the RDB. If the HDB is serving queries to the gateway similar to those described in the preceding section, then it would be recommended to route future queries to the secondary HDB. This could be signaled via error handling in the end-of-day function when the re-load of the HDB following write down fails. 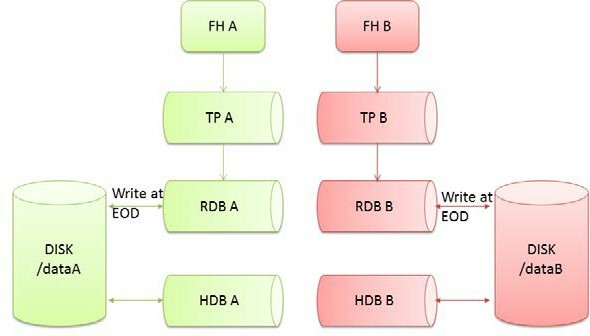 To restore functionality of the HDB, due to the complexity and variety of potential issues, it is not recommended to automate any editing onto database partitions. However, auto detection of many bad states of an HDB is possible and desirable in a lot of cases and this can guide any necessary manual intervention to fix the issue. This is fixed using either .Q.chk to save empty copies of all tables or .Q.bv to create in-memory mapping of missing tables. This may arise due to a lack of data having been received for this date, and the end-of-day write function therefore skips this save. Unless .Q.bv is in use within HDB processes then the end-of-day write function should save empty tables as well as those containing data, either directly, or via .Q.chk. This is usually due to a column vector being a different length from the rest of the table. The only method to fix it is to count each column file and compare, then manually saving the erroneous one to the correct length. This can occur when not using the standard save commands (.e.g .Q.dpft), but rather setting each column individually, and some logic has caused the column lengths to vary. In an adequately specified 64-bit system, one tickerplant is usually enough to capture all the data from a feed. A kdb+ process is able to process and store up to 4.5 million streaming records per second per core and up to 10 million if batching. If the throughput is expected to exceed these figures then additional tickerplants or cores may be required. It is very unusual that a tickerplant process would fail on its own, as it is limited to certain specialized tasks; though if incorrectly configured it may fail. If a tickerplant does go down and fails to restart, then there will likely be significant data loss on the primary system. If the tickerplant is capturing high volumes of market data, even being down for a few seconds could lead to hundreds of thousands of missed rows of data. Failure in a multiple tickerplant environment can be treated in several different ways, depending on the application and failure type. One possibility is to switch the entire system to the secondary system. This is the standard approach taken in most applications. The easiest way of failing over in this way is to shut down the primary processes, causing all further queries to route to the secondary. Then, during a scheduled downtime period, the underlying cause of the failure can be investigated and addressed. Alternatively, in some more complex systems, it may be preferable to only failover individual processes or a selection of relevant processes instead of the entire system. In this scenario, if the tickerplant dies, this could trigger a failover of the subscriber to the secondary process. The subscriber isn’t lost and could reconnect to the secondary TP, allowing seamless transition. Clients that have subscribed to the tickerplant will receive a closed connection callback to .z.pc. They could then use this to seamlessly switch over to the secondary. Depending on the time taken to switch and connect to the secondary tickerplant, there may be some data loss. However, the primary and secondary systems are usually in separate data centers, therefore this procedure would force data to be considered in large volumes between sites. Hence, this option needs to be carefully considered against the specific architecture of the system. Following failover of the system or subscribers, due to the data loss or risk thereof, it is necessary to reconcile the data between the primary and secondary databases. Refer to the following section on data reconciliation for further details. As mentioned previously, during replay of a large tickerplant log file, pending messages will sit in the IPC queue waiting until the subscriber (RDB) has completed the replay. If however, the log file is sufficiently large that the IPC buffer fills with pending messages, then the overflow can bloat the TP memory. In the financial world, this can be the case late in the trading day when the log files are nearly at the maximum size, so restarting an RDB just before market close is the worst scenario. Unless protected from slow subscribers, the tickerplant memory footprint may, in extreme circumstances, grow to an unmanageable level, resulting in a wsfull error. Therefore, aside from suitable dimensioning of the TP host machine for RDB restarts, the tickerplant log files should reside on high-performance, dedicated drives with no contention from other processes. This ensures the RDBs will have shortest recovery time, and therefore reduce the risk of wsfull failures on the tickerplant. In some implementations intra-day write-down solutions are used to limit the size of these tickerplant log files to less than a whole day to limit the recovery time of any replaying of these logs. Other implementations have a ring-fenced instance for write-downs often termed PDB (persisting database) or WDB (write database). Infrastructure should be designed and implemented with no single points of failure at the primary and disaster recovery facilities. Even with these precautions, hardware failures do happen. To help recover from a hardware failure or reduce its impact, we recommend that a system have multiple copies of data running on different infrastructure, in addition to point-in-time backups stored on physically separate storage devices. Data can be copied, backed up and synchronized using a combination of file system utilities, kdb+ processes, and storage hardware and software disk-based replication. The choice of approach depends on availability, RTO, RPO, performance requirements and available budget. Data recovery from a point-in-time backup will require restoring the system using both the point-in-time backup and tickerplant log files, which will contain any messages received since the last backup. Therefore it is extremely important to have sufficient backups of tickerplant log files in addition to backups of the database. During a hardware failure, such as a disk failure, the performance of a primary system may be degraded during the recovery process, which may necessitate failing over to a secondary or disaster recovery system. Provided the secondary systems are running on different hardware, a hardware failure can be treated similarly to a software failure and failover can again be controlled via .z.pc signaling. If however, the secondary system is running on the same server or infrastructure, no recovery can easily be made until the hardware issue has been resolved. There will possibly be data loss as well in this scenario. Network connection problems can sometimes be hard to diagnose. However they are treated similarly to a software failure as an unreachable process is deemed indistinguishable from a non-running process. A full failover to the secondary system should be made if there is a network failure on the primary. This can again be controlled via .z.pc signaling. In the event of a failover from the primary to the secondary system, there will always be a risk of data loss on the primary side. Even if callbacks were used to switch subscription to the secondary, during this switching period there may be some data missed, for example, the secondary tickerplant may have processed additional messages prior to the receipt of the subscription request (.u.sub) from the primary RDB. As such, it is usual for a process of data reconciliation to be configured for the end of the day. In the most basic setup, this could simply be a copy of today’s HDB partition (and syncing the sym file). A more thorough method would be running some checks on the primary data for the day to check if any data was missed prior to any copies. Control reports are often used to perform periodic checks to ensure both systems remain in sync near-real time. These checks can be used as part of the reconciliation period to ensure that the process worked, or to check which data is required for syncing. A basic example would be getting the totals or counts from each table. As most data feeds publish sequence numbers these can also be used for assessing data correctness. In most systems, there are other types of non-tick data stored in the database, such as reference data. Depending on the design of the reference data loading process and the nature of the DR event this data may be required to be synced between both systems during the reconciliation process. Again this may be a copy from the secondary system to the primary system, but more often reference data is loaded directly into the primary system, usually from a CSV file, and then checks are performed to ensure that the correct reference data was loaded. A hot-hot configuration (primary and secondary) along with a cold offline/offsite backup (DR) is usually the best configuration to support high-availability and data security, but dependent on hardware resources and availability requirements, a cold DR copy/backup may be sufficient. Of critical importance is backing up the sym file within the HDB root, sufficiently and regularly. This file is the key to the HDB, (all symbol type fields within the database are enumerated against this file) and if lost then the data will be very difficult to recover. The sym file is an ordered list of symbols, (e.g. `GOOG`APPL`MSFT…) sometimes tens of thousands of items long. Symbol type columns within the HDB are stored as integers that map to the position index within the sym vector on loading of the HDB. If the ordering is lost, or incorrect then the mapping of symbol type columns within the HDB will be wrong. If it is necessary to recover the sym file, then the previous sym file backup should be used, against which any new symbols received into the system may be added, in order. Fortunately the tickerplant log files contain these new symbols, so it is simply a matter of replaying the necessary TP logs files in order and enumerating the replayed data against the restored sym file. However it is important to enumerate the data in the same order that the data was originally saved, and also be aware of any other non-tick data which may have been enumerated against the sym file since the last backup. When a system has failed over to the secondary side, this is the last line of defense and usually, there are no more levels of active redundancy. If anything further should happen, the system will likely be offline, and depending on the nature of the failure event, there could be data loss and potential problems with recovery. As such, it is important to restore the primary to a functional state as soon as possible. For a process to have failed, there could have been a variety of reasons. Therefore the first step in fully recovering the system is understanding why the failure occurred in the first place. Perhaps the rate of streaming data increased significantly beyond the expectations when the server was originally specified. Perhaps a poorly-formed query caused the memory usage in the RDB to spike. Usually failing back to the primary node should be done outside of operational hours. This allows for the necessary downtime to investigate the underlying cause and allows for the possibility of other issues occurring on restart. However as mentioned previously this may not be possible in systems that have no maintenance or downtime window available for fail-back. If this is the case the restoration of the primary must occur in parallel with normal operations on the secondary system. During this period all queries should be routed to the secondary, and it is only when recovery is complete and functionality is validated that the primary should be made available for receiving new data and serving queries. As the typical configuration is hot-hot, then once the primary is restored fail-back is complete as both primary and secondary are available for data capture and to serve queries. In alternative configurations such as hot-warm, an additional step is required to fully restore the primary as the hot system. This can be as simple as re-routing queries to only hit the primary system. The previous sections describe the suggested approach for designing disaster recovery and failover from a kdb+ tick point of view, with database backups and ticker-plant log files used to avoid data loss. However, kdb+ also provides in-built logging, checkpointing and replication which can provide a level of redundancy in more complex setups. A basic example of these features could be using the replication to support CEP processes in syncing a table between primary and secondary. This process pair can be configured such that the secondary subscribes to the primary, and all state changes on the master (primary) are automatically replicated to the secondary. These changes are logged to disk as well, to allow for recovery in the event that the process fails. 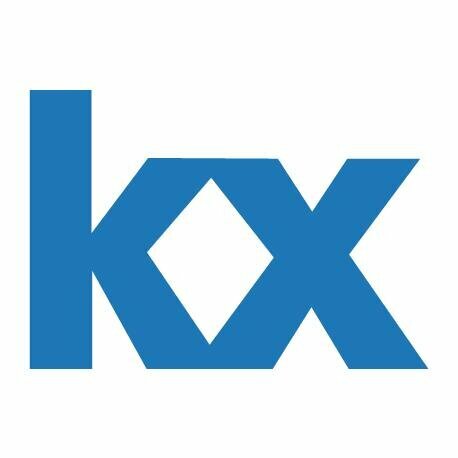 Control for Kx is a code- and process-management system that provides robust failover management along with standardized logging, error handling, and process monitoring. These features, coupled with the process templates, provide the framework for quicker and easier development of custom kdb+ applications. Tried-and-tested failover solutions provide the flexibility and scalability needed to meet any resilience or availability requirements. This whitepaper has stressed the importance of disaster-recovery planning. There is always a possibility of disastrous events occurring, therefore it is vital to plan effectively to mitigate any impact on the system if problems occur. The paper has covered the majority of possible failure scenarios which can occur in a kdb+ tick system and explained how the operations should be designed to handle these failures. DR should cover permutations based on a risk assessment (impact and likelihood), therefore as part of DR planning one of the main questions to consider is “does the plan account for all possible permutations considered in the risk assessment?” That is, does the design include steps if all/any of the critical and/or non-critical components are compromised? If not, then the DR plan is incomplete. Murphy’s Law states that if it can go wrong, it will go wrong. By this adage, if the DR design has omitted a potential failure path, then it will happen. Therefore, all possible event paths must be accounted and planned for in the design, such that any system impact caused by future events can be minimized. In our example system, the main goal was to minimize downtime and maintain availability of the system following major incidents and DR events. Depending on the use case, minimizing downtime may be prioritized over preventing data loss. In both cases, if the design has not correctly allowed for regular data backups, there will be issues when trying to recover during failover. This is why backups of the tickerplant log files are necessary in addition to backups of the database, as any ‘lost’ tick data can be replayed from these logs. It is important to note that even with the best planning, unknown events can still occur. The issues experienced by an airline in the example given in the opening paragraph were caused by human error, which was completely unplanned for. With this in mind, it is important to understand the implications of these failure events, and through a proper recovery plan based on a risk assessment and RPO and RTO specifications design a solution which can minimize downtime (i.e. high availability), recover quickly and accurately from these events, and most importantly prevent and minimize data loss. Stewart Robinson is a kdb+ consultant currently based in Belfast. He has developed various kdb+ tick applications, focusing on market surveillance, for some of the world’s largest financial institutions. The examples here are edits of r.q from kdb+ tick. As discussed in the main paper, often the primary and secondary sites are separate, hence large data transfer between the two could be problematic. Opening a handle to a separate process takes some time. Additionally, as the server may be busy it is recommended that the all necessary handles are opened on startup.